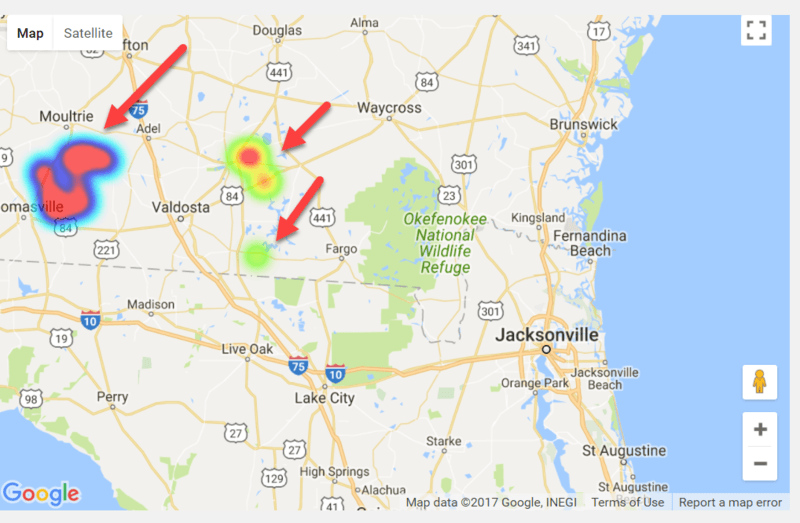 This article covers using heatmaps with WP Google Maps. This article is based on WP Google Maps v6. Wikipedia defines a heat map as a graphical representation of data where the individual values contained in a matrix are represented as colors. In WP Google Maps v6 the colors represent the density of “Markers” on the Map within an area drawn in the Map Editor. Since the radius of the heatmap area is fixed regardless of zoom level, it’s useful for showing a lot of things that gradually separate as you zoom in. Open (or Create) the Map you want to use in the Map Editor (WordPress Dashboard → Maps). Click the Heatmap tab to open the Heatmap Editor. On the Heatmap Editor page, click the Add a New Dataset button. If you have existing datasets, you can click the Edit button. Give your dataset a Name. You can choose between the Default Gradient or a Blue Gradient for your Heatmap by clicking the appropriate button. The chosen button will display a border for a few moments. You can adjust the Opacity of your Heatmap by entering any value between 0 and 1.0. These numbers represent a percentage between 0 and 100% (.1 is 10%, .2 is 20%, and so on). 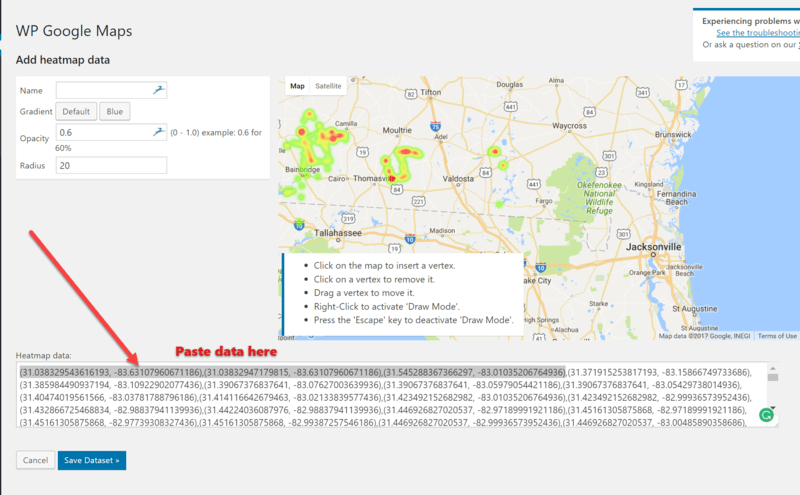 You can also modify the Radius of your Heatmap by entering a new value in the Radius textbox. 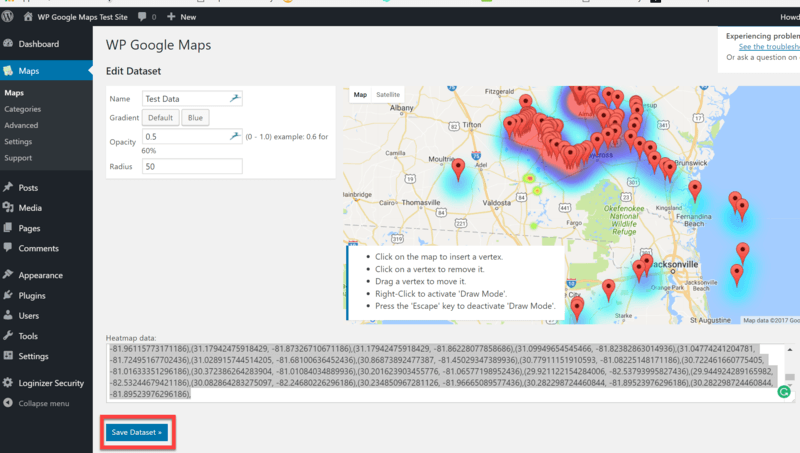 When you’ve added all your data Markers to the Map, click the Save Dataset button. Don’t forget to click the Save Dataset button to save your data. 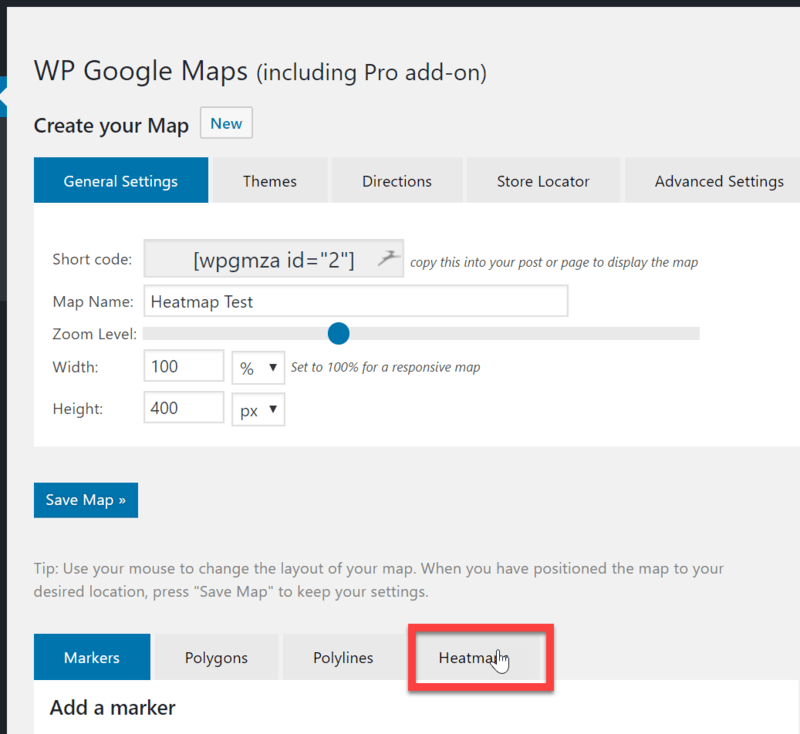 This article covers using heatmaps WP Google Maps. This article is based on WP Google Maps v6. WP Google Maps v7 (currently in development) makes significant changes to this feature. If you need further assistance or are having other issues with the plugins, feel free to visit our Support Desk.